Sabarimala Makara Jyothi Darshan Watch Live Online now. Check Sabarimala Makara Jyothi Darshan dates book tickets online. One of the natural reasons to belive that lord ayyappan is in Sabarimala is Makara Jyothi. Many devotees believe that lord ayyappa will appear as a divya jyothi in sky on the Makara Sankramanam day. Let’s know the darshan timings, importance and other details about Sabarimala Jyothi Darshan. This was observed on 13th or 14th January every year. 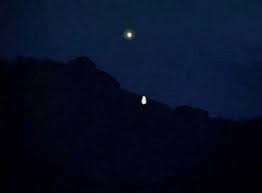 Of all legends devotees believe the Makara Star will appear in the sky on the auspicious day of Makara Sankramanam. The hindu calendar has two cycles one is Uttarayana Kalam and other is Dakshinayana Kalam. Uttarayana was considered as sacred for hindus. The junction of two time cycles is called makara sankramanam. As per Hindu calendar the Sun will move into Makara Rasi on this day. Every year January 2019 14th or 13th day temple was opened till 6:45 PM IST. Prior to two days the ornaments of Ayyappa swamy were being transported or carried by the tantris from pandalam palace to sabarimala on foot. The idol of ayyappa swami was decorated with the ring, dagger, crown, necklaces and manimala. The only day ayyappa was decorated with ornaments is Makara Sankranthi. More than 2 lak devotees will gather on the hill to witness the Maraka Jyothi with their eyes. On morning of this day the queue was stopped for trekking from Erumalai. The pamba queue was stopped on the same day. Devotees are allowed for normal darshan and after ayyappan alankaram is done the doors of temple are closed once the makara jyothi was appeared. After the jyothi was completed the temple doors are opened again. There was no special way to book darshan tickets for makara jyothi darshan. Only devotees need to visit the entry queue at the right time and have the darshan. We advise you to confirm Sabarimala Booking Accommodation during this time. All the news and Devotional channels will stream the live telecast of this day in sabarimala. Right time to watch the jyothi darshan live is 5:45 PM IST. After sunset the temple jyothi darshan was commenced. Do you guys Think Poor people who are not able to use internet dont want to live in the world. What is this nonsense Online, and virtual q. Utter nonsense you gov are doing!! !